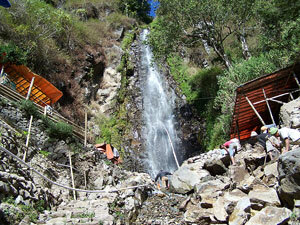 Tirtosari Waterfall is located about 2,5 Km southwest side from Sarangan Lake, can be gone through ride horse or by foot. At this Tirtosari Waterfall location can be enjoyed beauty natural, water that flow from about 50 M height downward through a slot that flanked by precipitous stones give a beautiful view and it interesting. According to public belief if we enjoy the Waterfall Tirtosari we earn to ageless and beautiful. Meanwhile, Tirtosari Waterfall has a beautiful and fresh waterfall that brings a fresh situation for the busy people who want to refresh. IT can clear our mind from a tired day.